One word to define you: Cheery for Enéa, Cheerful for Marc and Enthusiast for Tim. 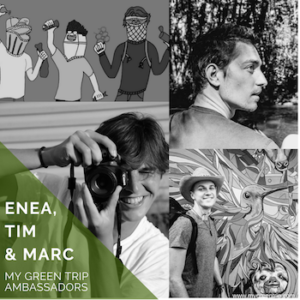 Favorite travel destination: Moutains for Enéa, Nicaragua for Marc and Alsaka for Tim. Travel weapon: His bike for Enéa, his camera for Marc and his eyes 🙂 for Tim. Because we have to reconsider the way we travel in a more sustainable way! We have the luck to be able to travel and to learn a lot from the places we visit. But travelling is not just about receiving, it’s also about giving. Limiting our impact and taking with us some good vibes is important to us as much as leaving a neutral balance sheet behind us. We support all the causes that converge in the same idea: the preservation and the respect of planet Earth. There are so many causes we care about. But we have the ideal to reconnect the people with their environment and to raise awareness on environmental problems. The idea behind our project – Trash Talk – is to inform the people on what is waste and what it becomes. We wanna show the local effects of our over-consumption, and suggest some alternative ways of consumption whih are more aligned with the notion of sustainability. If a small group of people moves, the others will follow! It just makes sense to be an ambassador of a project who can sustainably change the way we travel and the way we interact with our environment. By carrying a very small bag and cleaning the waste on our way, we can do our “Colibri’s part” in a very simple way. In one of my lattest trip, in Nicaragua, we had lunch in a little park of a town called Matagalpa, where only few tourists could be seen. As we were looking at the people in the park, a little boy of around 4 years old came to us after having bought an ice cream with his father. We had a quick but really emotional encounter with them. They were from Chile and were just travelling together for a while. Traveling isn’t only about seeing beautiful landscapes or going to the adventure, it’s also meeting people you would’nt have talked to otherwise, and discovering the different cultures and societies the humans have built around the globe. As part of a bicycle trip from Lausanne to Istanbul, I have been invited to a stambouliote school on the first day of school to teach French. Seeing 6 years old children very motivated and open to the world gave me a lot of hope. During my last trip to Alaska, the immensity of this Arctic region and the little space that Human being takes in it made me aware of the power and importance of our planet. It acted like an awakening in me, which invited me to do everything to preserve Mother Earth.